But organizing is a personal process. There is no one-size-fits-all approach. It’s perfectly fine to adapt, challenge, or even break the rules if they don’t make sense for you. And some so-called rules are really myths. It can be liberating to realize you don’t need to follow those! Here are three rules you’ve probably heard, along with some reasons to question them. I actually like this rule a lot, and often advise people to follow it. In general, it’s a good idea to seek out items that can do double (or triple or quadruple) duty, to save money, space, and time. The kitchen is a great place to apply this rule. You can save tons of room and make your cooking easier if you limit the number of pots or knives you keep on hand, for instance. But some single-use items earn their keep. A coffee maker is a common example. It all depends on how you use your kitchen and what you like to cook. If you only serve coffee to guests, it might be better to put the coffee maker in storage. If you’re a gourmet cook, you probably do need a big variety of knives. In my own kitchen, I recently made room for an expensive popover pan. Yes, I could bake popovers in a muffin tin. But I love my special pan, and the beautiful tall popovers it makes! That pan only does one thing, but it does it very well, and it gives me a lot of pleasure. So it’s welcome in my kitchen! Let’s turn to the clothes closet for this rule. I like this advice too (although I might vary the time period). Still, there are times it doesn’t apply. If you haven’t worn a T shirt or sweater in a year, I’d probably recommend that you donate it and enjoy the extra breathing room in your closet. But I wouldn’t necessarily advise you to get rid of formal wear or dressy shoes. They’re expensive. They’re often in classic styles that age well. So holding on to them till your next party or wedding can be a good idea. I also keep my hiking clothes, even though I rarely use them, as well as a few running clothes I infrequently need. I know many people who keep outgrown baby clothes (and other items) because they’re planning to have more children in a couple of years. Again, it’s a personal choice, and of course it depends on your available space. But sometimes it really is OK to hold on to things that you don’t use much. For this one, let’s head to the office and consider paper. 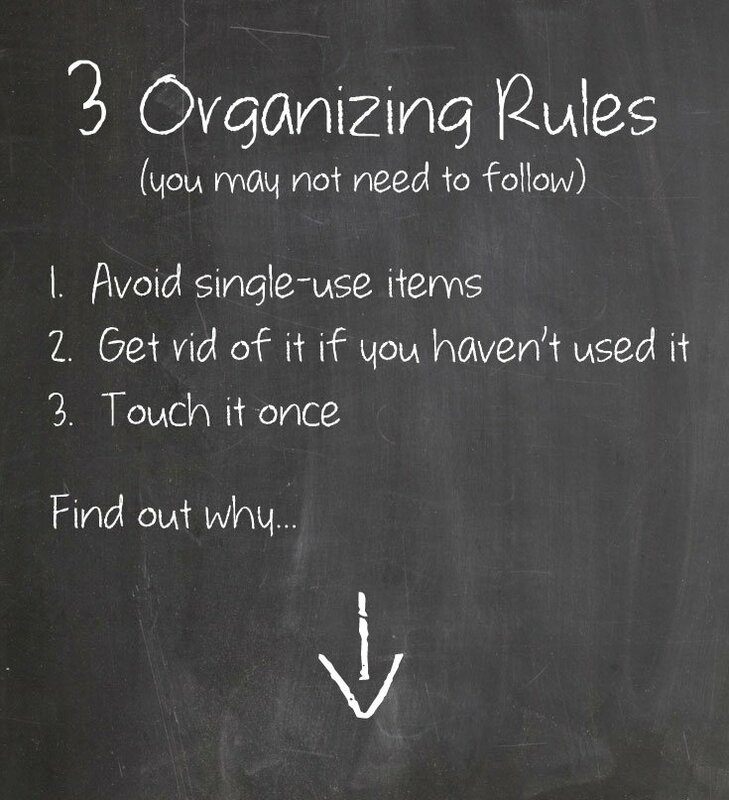 Often when I tell people that I’m an organizer, they mention their failure to follow this so-called rule. People feel sheepish or even flat-out guilty about this one. But “touch it once” (also sometimes called OHIO—“only handle it once”) is more of a myth than a useful rule. It’s not the number of times you handle a piece of paper that matters, but whether you have a plan. Let’s say you open your mail, find a bill, put it in a to-do file or other container, pay the bill later, and then file or shred it. You’re touching that paper several times. But each touch has a purpose. Your system ensures that the bill gets paid. It works. What you don’t want to do: throw that paper in a pile, then periodically rifle through—handling the paper again and again—without making a decision or taking any action. See the difference? In this case, those multiple touches have not moved you closer to your goal (a decision or action). That’s the kind of repeated handling you want to avoid. As always, when you’re getting organized, you have to do what works for you. It’s good to know the rules, and most of the time, it’s good to follow them. But it’s also important to know when you can take your own route to organization. I’d love to know: What organizing rules do you disagree with, ignore, or break? How have you adapted rules so that they work for you? Great tips, thanks for sharing. I think I need to attack my kitchen for those single use items. Thanks, Lisa. Yes, the kitchen does seem to attract a lot of single-use stuff, doesn’t it? But remember, it’s OK to keep some of it if you truly use and enjoy it! I love getting permission to break the rules! It isn’t a rule exactly, but I’ve learned to relax some on my overly-detailed filing systems. I love labelers and color-coding and all that goes with it, but found I was spending excessive time organizing and filing things that I rarely (if ever) needed to access. I read somewhere (sorry I can’t remember where – I read numerous professional organizers’ blogs) that it sometimes makes more sense to devote a little more time to finding the item when you actually need it, than to spend (or perhaps waste) hours and hours on perfecting the filing system. The tip was aimed at working with adults with ADHD (who might not enjoy the filing process to begin with), but since I lean a little toward the OCD side of the spectrum, I could see the benefit for me too. My filing categories have become a bit broader, and the system has become much less time-intensive. And when I need it, I still manage to find it fairly easily. I think filing systems are a GREAT area to simplify. And you’ve hit on something very important: to focus on making the filing (putting away) easier, and worry about ease of retrieving less. After all, you only refer to filed papers infrequently. I’m glad that the broader categories are working well for you! What a great perspective, Nancy! It’s good to think through tips and make them work for us as individuals. I use Quicken as an accounting program and my file folders correspond to the main revenue/expense categories, such as auto, home ops, home maintenance, etc. At year end, I review everything for tax purposes, shred what I don’t need to save and file the backup for the return. I may keep receipts for things which have a warranty or overlap a year. After taxes, the papers all go into a plastic file box and are stashed away with a “destroy by” date. Of course I do save some items as part of my permanent file (investment statements and home improvement invoices) but those are manageable files. Since my town expanded their recycling program, more stuff goes into that container. I started reviewing stuff in my kitchen where I have the recycle, shred and trash bins. So, only the bills and statements are moved to the office with the computer. I’ve found it easier to spend 15 minutes a day, writing checks or scheduling payments, entering into the computer and then immediately filing. The office is cleaner, less stressful and it is easier to deal with tax filings. By the way, the shredder is in the utility room – since it is impossible not to make a mess when emptying the bin. I just put it in the place where it was easiest to clean up. And it is closer to the back door for trash purposes. Sometimes, it is best to look at the entire flow of stuff through the house to set up the best routine to handle it all. I really like how you’ve thought through your system and done what works FOR YOU, not what you’re “supposed” to do. If the shredder makes most sense in the utility room, great–as you said, you’ve thought about the whole flow. It sounds like you’ve come up with a great way to stay current, neat, organized, and unstressed.